When all my family gets together there are 23 of us. Thanksgiving day only 16 were able to be there for the scrumptious meal prepared with loving hands. It truly was a feast. There was one thing missing from this years family celebration, and that was a venison dish, made by yours truly. If not some sausage at least some jerky, but “no” old “Mother Hubbards” cupboard (freezer) is bare! Probably the only ones to truly miss the “wild game” were the guys, but hey the kids like the jerky also. I made it out the day before Thanksgiving, but again didn’t see a thing. I did have someone quite close to me shoot three times, right around dusk. They probably dropped that little 5-pointer I passed on. Dummy! I sure haven’t put many hours in the stand this year, as I still don’t feel 100% over this flu/cold that’s worn out it’s stay around our house. Hopefully I’ll get some quality time in the woods come the cold wintry end of December. Think snow! On a more sober note I had made up an album of pictures of Joe Giarmo from over the years. Everyone had a chance to reminisce and talk about the good times we had with this humble man. How blessed my family was to know Joe as a true family friend and father figure. He gave so much to those around him, and required very little in return. Papa Joe has left a void in all our lives. Nina, Mindy, Nadia, and Ava looking at the picture album of Joe Giarmo. 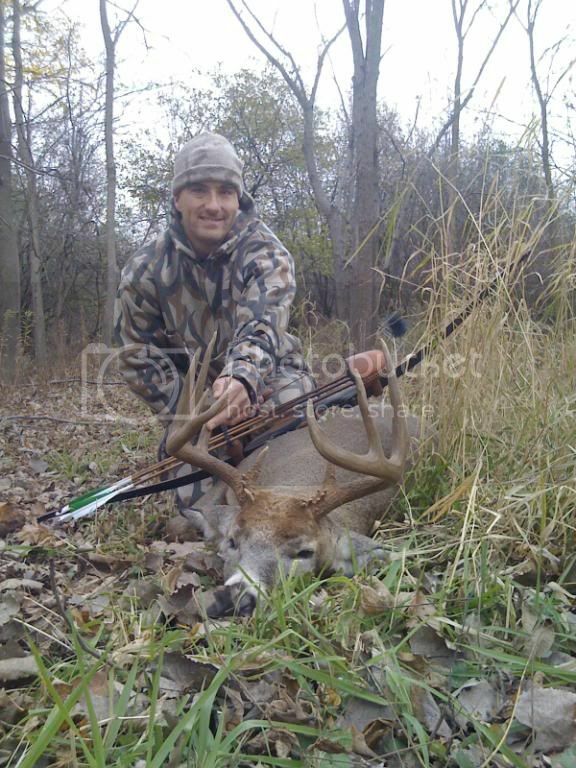 This is Tom (long bow) Hedke and the mid 140 class deer he took last year in Illinois. About a week ago I heard, through my nephew Grant, that Tom tagged another monster the nets close to 170 inches. He also took this years deer with his long bow. Three years in a row-three big bucks! 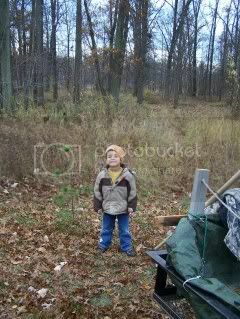 Reports of hunting success are trickling in with my nephew Derek taking a 7-pointer and a doe. Another nephew (Grant) also took a doe, and I’m still trying to put my tag on one. Personally I would rather hunt with some snow on the ground, and I hope we get some before the end of the year. Happy hunting. Is this the reason your not seeing many deer this year? At least one group of hunters has their own idea about the declining Michigan deer population. Just this evening I talked to my brother-in-law Pat Boylan who recently returned from deer hunting around Wellston Michigan. He stayed with his buddy Jim Chapman and five other hunters in camp. Jim knows the area well and most years he has no trouble filling out two of his deer tags. Those seven guys hunted several days of bow season plus 4-5 days of gun season and came home empty handed. Jim cannot recall that ever happening in the 20 some years he’s been hunting the area. The talk around their camp was centered on “What the heck has happened to the deer herd?” Pat hunted the Udall Hills area, and he reported finding several deer skeletons on his travels. There are many coyote in the area, as the guys saw and heard them on numerous occasions. Could these little wolves be the culprits? The consensus was a resounding “NO.” Sure coyotes are taking some deer down, but to the degree that changes a hunting “hot-spot” into a “dead” zone, no way. Here’s what the guys came up with, and agree with them or not, It’s what they believe. There has been a total baiting ban for two seasons now, and according to Jim, and his hunting buddies, they noticed a decline in deer numbers during the late December deer season. The seven hunters covered alot of ground, and to a man were sorely disappointed by the number of deer spotted. Wellston is in one of Michigan’s snow belt areas, and gets tons of the white stuff every year. The theory is that baiting has helped keep the deer healthy enough to make it through this areas brutal winters. Most guys purchase several hundred pounds of bait corn, carrots, sugar beats, and apples. The various bait piles, spread out over most of the deers range, allows the does, fawns, and bucks to fatten up for whats ahead. It benefits the deer, and on occasion puts some venison in the freezer. The guys agree that without this extra boast in the deers food supply, deer numbers are going to plummet. This is not an agricultural area where the deer can visit a corn or soy-bean field all winter. They can’t understand how one lone deer, being raised in a fenced in area, could cause a statewide ban on baiting! The question was asked about the effects on the overall deer herd due to this one private deer enclosure having a case of CWD? As it stands now, the hunters figure tens of thousands, if not hundreds of thousands of deer died off over the last two years due to the baiting ban. Who benefits from this scenario they ask? Why it couldn’t be the insurance companies could it? Pat said he’d eat his muzzle-loader if the car/deer crashes had not gone down over this two year period. The guys in this little hunting camp firmly believe someone in the “upper echelons” of government are in “bed” with the insurance companies. Interesting theory, and not all that crazy considering all the “sweetheart deals” that go on behind closed doors. A secondary effect of the baiting ban is how it has brutalized the Mom and Pop stores bottom line. Many of these little places of business depended on the extra income (from bait sales) to get them through the slow winter months. Just like the deer many of them are now gone also. Economically the little peons in Michigan took a huge hit, but I bet the Insurance Industries bottom line more than offsets what the small business owners lost. But that’s just a bunch of deer camp talk, by a few of the guys that pay the salaries of our duly elected officials. I’m thinking those seven guys got a better idea whats going on in the woods than some “desk jockey” making life changing decisions for the rest of us. What do you think? 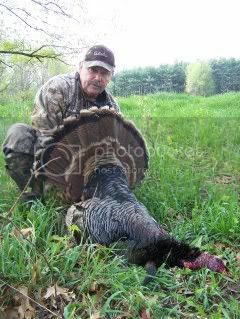 This turkey, from last Spring, sure tasted good to me! I recently read an article titled “Is hunting good or bad for the environment?” It came from the editors of The Environmental Magazine. I’m sure that you already surmised that the article does not favor the “barbaric” sport of hunting. The first paragraph talks about prey and predator, as a means of culling the overpopulation of some species. This overpopulation is a direct result of “man” killing off the natural prey animals, leaving the herd animals to reproduce beyond the environments carrying capacity. It goes on to suggest, in the next three lengthy paragraphs why hunting is barbaric, and causes immense suffering to individual wild animals. Glenn Kirk of the California based “The Animals Voice” says that the killing of any animal is morally wrong. Before I go on I would just like to interject that if I was a betting man Mr. Kirk is “Pro Abortion.” Strange as it may seem, these protectors of innocent animal life, don’t bat an eye when it comes to the death of human babies due to abortion. Something is radically wrong with this picture. 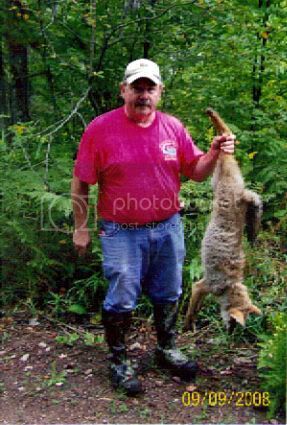 The article goes on to state that hunting is not practical, and that many species, such as waterfowl, upland birds, mourning doves, squirrels, and raccoons do not require population control. Obviously they have never stepped in goose crap at the beach, chased 12 squirrels from the bird feeder, or been bitten by a rabid raccoon. They also state that agencies like the DNR manipulate target (deer) game populations, in order to bring in money for the state! Well the Michigan DNR better get with the program then, as I’ve only seen one deer so far this season. What a bunch of lousy manipulators. My brother Randy just got back from two weeks of hunting in the Upper Peninsula with his son Justin and one of Justin’s buddies. The DNR is also failing to manipulate the herd very well around Marquette, as they brought home one 5-pointer and that’s it! Randy said he only saw 6 doe’s in the whole time he hunted. He also thought the “rut” was running behind schedule, as scrapes were just starting to appear a few days ago. We need some cold and snow to get things moving! Since my friend Joe died I can’t get my “heart” into writing, but I know I have to get moving soon, so here we go. It’s been a little over a week since my first foray into the deer hunting woods. Hunting in the middle of suburbia is “way” different than what this country boy is used to. There were dogs barking, horns honking, tires screeching, gunshots going off, lawnmowers running, and kids yelling just to name a few of the distractions around me. I felt this was the biggest waste of time I had ever put in a blind. The guy target practicing a few hundred yards away didn’t quit till just before 5:30 p.m.
At 20 minutes before six o’clock I stood up to give a series of grunt calls, and looked out the blind window at a buck about 25 yards away. 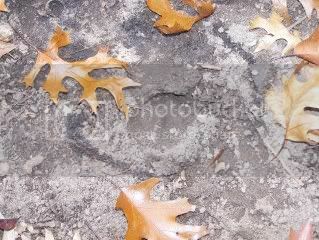 I was in a stand of old oaks, with tons of acorns on the ground. He was a 5-pointer with three on one side and a spike, with a kicker, on the other. He meandered as close as 15 yards, and I could of shot him on numerous occasions. The television show Versus, and in particular “The Bucks of Tecomate” kept playing in my mind. David Morris or Jeff Foxworthy wouldn’t dream of shooting this little itty, bitty, girly, baby, buck. Why if those boys found out I shot such a small buck they’d never speak to me again! So like an idiot I passed him up. In hindsight I still don’t know if I would shoot that deer, but I’ve been out twice since and haven’t seen a thing. I have no meat in the freezer, and I’m second guessing myself now. Who am I fooling, I’m no trophy hunter. I’m not a quad-zillionaire like David Morris, with several thousand acres, tons of huge bucks, and a wildlife manager at my disposal. Bottom line is I’ve been watching to many big bucks get killed on T.V. and forgot the reality of hunting here in Michigan. I like venison way to much to be turning down an almost sure thing. If someone else don’t tag that little bugger, he better not tempt me again, cause I’m laying off Versus, or at least until I get a deer. Joe and State Rep. Herb Kehrl at the opening of Joe’s Boxing Club at the Power-House gym in Monroe. Today is the day of my “Pal,” Joe Giarmo’s funeral. I’ve discovered through his passing that one is never fully prepared for the death of someone they love and respect dearly. Even though Joe was 93 years old, he was independent and loved being able to take care of himself at his home on Michigan Ave. It did not set well with him when, by Dr. orders, he had to spend time at Fountain View rehab. center, where he passed away last Saturday. Joe was doing his therapy, and being a “somewhat” of a good patient, but was chomping at the bits to get back to his house. Those of us who knew him felt Joe would make it back home shortly, and live to be a hundred. Most of us couldn’t phantom “not” having Papa Joe around. Joe had a neighbor across the street (Reverend Hopper) who Joe would take out to breakfast and dinner at Bob Evans. They were good pals, as Joe was with most of his neighbors. Joe was the kind of guy that made a neighborhood a “neighborhood!” He was always willing to help out, and was still able to “fix” most anything mechanical. Just a few months ago I was having problems with my ride on lawn mower. I asked Joe if he knew of a good place to take it, and he told me about a small engine repair shop on 13th. street. He told me to swing by and get him the next day, and he would go with me. The following morning I got a call from Joe and he says “I’ve been up half the night thinking about that darn lawn mower, and I want to look at it before you take it to the shop.” He came over and popped the hood on the mower. I started it up, and after hearing it run for a few minutes he told me to get him a screwdriver and some W-D forty. In five minutes he had it “purring” like a kitten. You would never guess Joe was 93 years old. Stories of Joe’s friendship, compassion, and love abounded at the funeral home. Grown men were driven to tears. Some sobbed for most of the evening. This man was special. He touched so many lives, and made “men” out of so many “boys” that his legacy will live on for a long while. Many of Joe’s boys were there paying respects to the man that was more than a coach, but a true father figure in there lives. Bob Patterson, Don Barton, Tony Collino, Randy Goins, Todd Riggs, Jack Giarmo, John Giarmo, Billy Giarmo, Tim Anteau, Kelly Duffy, Ryan Wilborn, John Martin, Bronco McKart, the Gross family, the Fishers, and the Barnes family just to name a few. There were so many more, and they all had one thing in common. 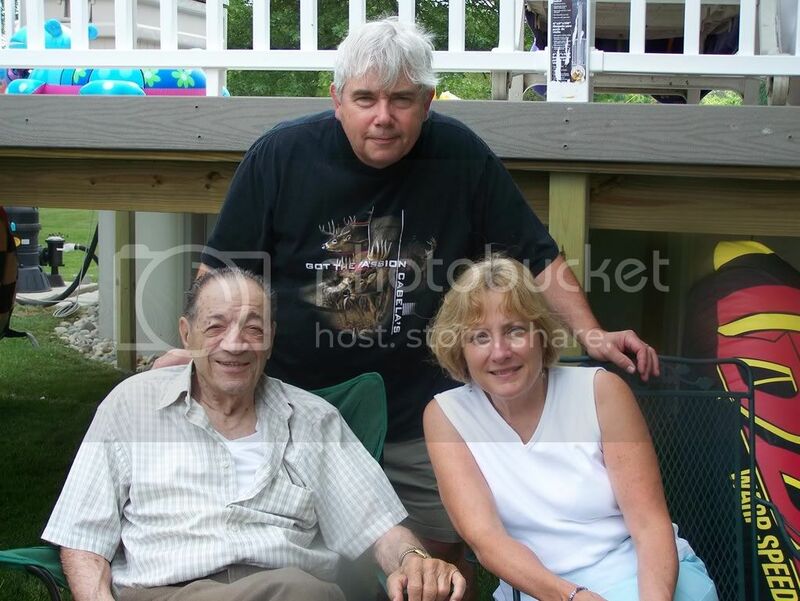 They loved and received love from this man Joseph Francis Giarmo. Today is going to be hard on many of those attending his funeral service, myself included. The family has asked me to be a pallbearer, of which I am honored and grateful. Joe’s daughter Kay has been a real steady guiding hand through these days, and has been remarkably composed and organized. I watched her grandson Dante go up to Joe’s coffin last night and touch his great grandpa’s hand. It was very touching as he said good-by to his Papa Joe. Kay’s son Todd and her husband Larry have been so supportive along with the whole Giarmo family. Scripture tells us that “Love” is the only thing in life that is truly important, and that love is the one thing we can take to Heaven. Well Joe is certainly taking alot of love with him, but he left so much here that our hearts are truly comforted. Thanks for being here for so many Joe. You were one of a kind. I’m sure The Heavenly Father has a special work for you to do in his Kingdom. Time goes by so fast, and it won’t be long before you see many of us again. Love you Always. I have not been able to bring myself to do any writing due to the fact that my good friend, and father figure died this past Saturday morning. Joe Giarmo was 93 years young, but those of us who knew and loved him just could not imagine life without him around. He was at Fountain-View rehabilitation home after having a small heart attack a couple weeks ago. He was progressing nicely, except he didn’t want to be there at all. He even took a short visit to his house the day before he passed away, to see if he could be released to go home the next week. He went peacefully as his body and heart just were wore out. Joe was a local legend, as he coached boxers for more than 60 years. Hundreds and hundreds of boys owe Joe a debt of gratitude for teaching them, not just about boxing, but about life. Many a young boy Joe took off the street and turned their lives around for the good. From our former mayor, to CEO”s, to police captains/lieutenants, coaches, union officials, and just plane old working people Joe showed them how to treat people and how to believe in yourself. Respect others and respect yourself is what Joe taught. 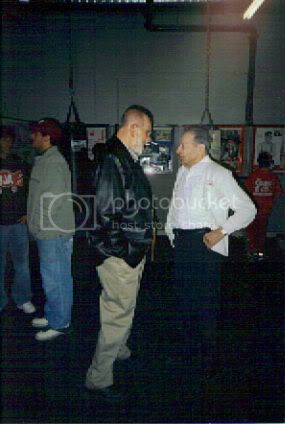 Joe put Monroe on the map in the 50’s and 60’s with his championship boxing teams. He had Golden gloves champs, state champs, AAU champs, national champs, Olympic hopefuls, and world champions. Joe’s trademark “left hook” was the bread and butter punch for many of Joe’s boys. Many will give honor and tribute to him over these next several days. The last e-mail Joe ever wrote was to me, his Pal. He signed it “I love you, Joe.” He was a man of passion and compassion, and me and my family are so blessed to have known him. 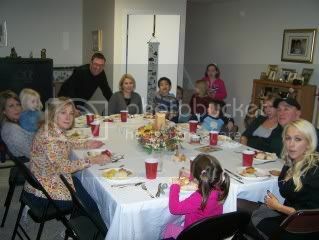 Joe was a faithful Catholic, as is his huge Italian family. It is kind of ironic though that God surrounded him with many Baptist/Evangelist/Spirit Filled friends (myself included.) If you are numbered among us (Protestants) you will know what the sinners prayer is. Back on Oct. 19th. 2005 my wife and I knelt with Joe in his living room, as he repented of his sins and asked Christ into his heart. Joe wept with us as he was assured of his home in Heaven. I am comforted that one day soon I will see Joe again and we will have an eternity to explore the vast reaches of the heavens. Who would of thought that one simple kid, from the east side of the tracks, could of left such an impact on his community. You left a legacy of love Papa Joe, and your memory will be cherished forever. Till we meet again. I remain your son, brother, pal, and admirer. The Lord works in mysterious ways! As of today I have a tree stand up and a ground blind in place. I was able to do it while watching my grand son Kyle this morning. I have permission to hunt a small piece of woods just a 25 minute drive from my house, and the deer sign is encouraging. The above scrape is near my ground blind. The tracks that are in the scrape aren’t huge, but at least I know there’s a buck in the area. I’m thinking in a few more days there is going to be alot of buck activity. I saw two dead deer by the road on my way out scouting yesterday. That tells me that the bucks are chasing does, and drivers better beware. The tree stand is along a fence row boarding a bedding area. I put it among a stand of oaks, and my little buddy Kyle helped me. He carried two sections of the ladder stand all by himself, and handed me tools, as needed. I found one scrape and several buck rubs along this obvious corridor. I made my own “mock scrape” and can’t wait to check it out tomorrow. Hopefully I’ll make it out Friday evening, but Saturday has been set aside for sure. I’m excited, but also very thankful that I now have a hunting spot close to home, and it isn’t going to interfere with my commitment to my family. My “big” little helper Kyle. My grand kids have had some health issues, the economy has plagued several of my children, my mom hasn’t felt well, and my good friend (like a dad) Joe Giarmo recently had a heart attack. I just got over a bout with gout and an infected saliva gland (by Gods grace and prayer.) Through all this my focus has been, and will continue to be, my family. As important as hunting season is to me personally, it shrinks in comparison to the value I place on my family. To be honest it wasn’t always that way. At one time my priorities were out of whack. Looking back I now see how selfish I was for many years, as my wife and kids played second fiddle to “MY” time in the woods. When it came to hunting money hardly mattered. Sometimes I would loose all sense of balance when it came to my wants, and my families needs. My wife is a bone-a-fide Saint. Maybe its a matter of maturing, or maybe its just old age. I’m sure much of it has to do with becoming a born again Christian, and receiving some great bible based teachings on the things in life that matter most. I will not take one of my Pope and Young bucks with me when I depart this earth. My 500 pound black bear (which I sold years ago) will be “wherever!” Caribou, wild boar, turkeys, big fish will all rot and decay and end up in a landfill one day. Pictures and scrapbooks may get dusted off and looked at once every ten years, or hidden in a trunk and sold in a garage sale sometime down the road. I’ve come to understand that there is only one thing I can take with me and thats the love I give my family, and the love they give me in return. I Corinthians 13:4-6 says “Love is patient, love is kind. It does not envy, it does not boast, it is not proud. It is not rude, it is not self seeking, it is not easily angered, it keeps no record of wrongs. Love does not delight in evil but rejoices with the truth. It always protects, always trust, always hopes, and always perseveres. Love never fails.” I can possess all manner of wisdom, wealth, and power, but without love I am nothing! I guess I’m trying to say I’m content where I’m at right now. I still have a long way to go concerning getting a grip on Agape love, but I continue to strive toward that calling that Christ has placed on my life. Rev. Martin Luther King said he had been to the Mountain Top, and what a difference it made in his life. 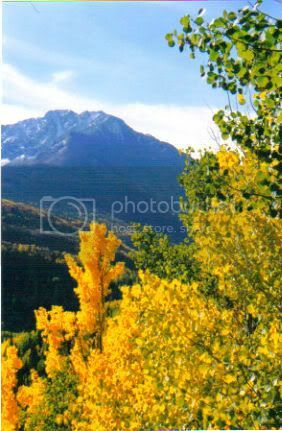 I also have been to the mountain top, in more ways than one, and it gives life a whole new perspective. The journey will end for all of us one day. It’s important that we consider “Whats Next?” As for me and my house we will be on the most exciting adventure imaginable. I hope you join me on my travels. Surely the mountains reflect His glory! From left to right. 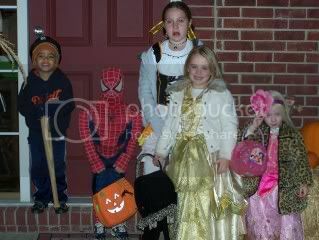 Kyle, Jacob, Nina, Ava, and Addisyn getting ready to ring some doorbells. It was a little chilly, but no rain or wind, so all in all it was a good evening. The kids got more candy and treats than they need, and were not even tired when they got back to my daughter Courtneys house. We had ordered pizza, plus a salad, and guacamole before everyone went out, and watched the World Series when they got back. Those Yankee’s did it again. It was a good evening with family, but I missed the five grandkids that weren’t there. Hope you all had a safe evening and the little ones didn’t have too bad of a “sugar high!” A few of my grandkids seemed to be “fired up” before going home with their parents. I keep telling them that “moderation” is the name of the game. I’m glad I don’t have to put them to bed.